We all know Kentucky's horse farms and hills are stunning sights, but have you explored what lies beneath these picturesque landscapes? You may not realize it, but Kentucky is home to an extensive system of caves, some of which may be toured. Cave exploring, also known as spelunking, is an ideal activity for science buffs and history aficionados alike. The world's longest surveyed cave system, Mammoth Cave contains 400 miles of explored passageways, with more being discovered each year. Mammoth Cave National Park provides tours covering more than 10 miles of the system. Most tours cover 1 to 2 miles. Along with its immense length, Mammoth Cave houses clues to how the cave has been used by humans for thousands of years. Feel like going on an underground boat tour? Well, this is one spot you can do it. In addition to exploring this 7-mile cave system—including having to lower your head to enter an enormous cave—there are daily nature activities, easy walking trails, a discovery cave crawl for kids, and more. When this cave was discovered in 1859, its first visitors said the area's glimmering stones looked like diamonds, and thus Diamond Cave received its name. The fourth-oldest cave attraction in the country, Diamond Caverns has a lighting system and handrails. The guided tour is a half mile. Smaller than other Kentucky cave attractions, Crystal Onyx was discovered in 1960 and is now considered an important archeological site because Native American remains—some more than 3,000 years old—were found in the cave. Tours are a half mile and last approximately one hour. Located beneath the city of Horse Cave, Hidden River Cave was once the source of drinking water and hydroelectricity for the community. Groundwater pollution led to its closing in 1943. In the late 1980s, the American Cave Conservation Association relocated its national headquarters to Horse Cave to restore Hidden River Cave and open a museum and educational center at the site. A bat rehabilitation center is also in progress. 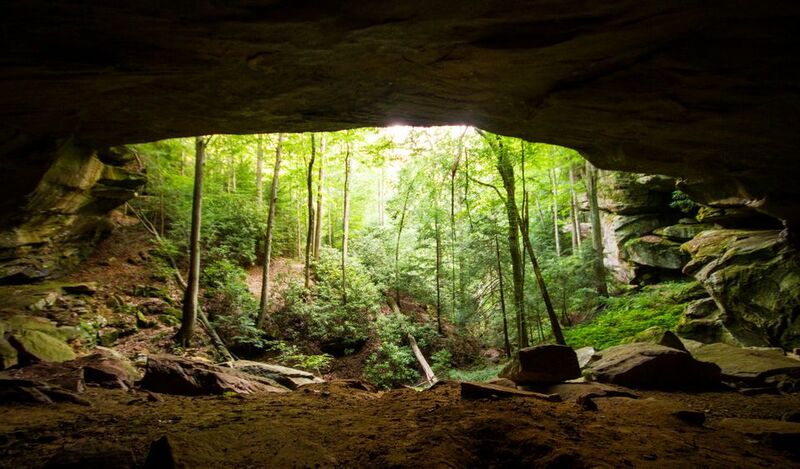 Hidden River Cave is now open to visitors year-round. Discovered in 1799, Mammoth Onyx Cave is part of a larger, Australian-themed attraction called Kentucky Down Under. With kangaroos, a bird garden, gem mining, and an outback cafe, Kentucky Down Under is a popular family attraction. A tour of the cave is included in admission to Kentucky Down Under. Onyx Cave is a wet cave that was discovered in 1971 when a parking lot was being constructed. With its beautiful coral, a 40-foot column, and a wall of cave bacon, it was decided that it would be an attractive Kentucky cave tour; it opened in 1973. The cave is 60 degrees and tours are 30 minutes. Outlaw Cave offers a guided tour of many classic cave formations. The cave was named Outlaw because bandits such as Jesse James hid out here and in other area caves. The natural formations were not only hidden but also large enough for the bandits to ride their horses into.